So yet again Revlon have got bloggers and youtuber's excited about their latest lip product, the 'Just Bitten Kissable Balm Stains', a drugstore alternative to Clinique's famous 'Cubby Sticks Lip Balm'. The packaging is so similar to Clinique's Chubby Stick's that I think Revlon have been slightly cheekey in their design. 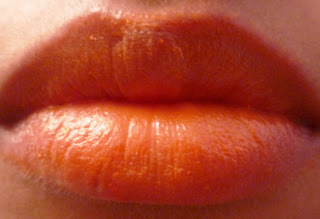 However the 'Just Bitten Kissable Balm Stain's' do feel very luxurious at practically half the price at £7.99. Although this range consists of 12 versatile shades, here in the UK we only have 7 shades to choose from - which is still not bad! I was very reluctant about Revlon's 'Just Bitten Kissable Balm Stain's' because I really didn't get on well with their lip butters however I am pleasantly surprised and much prefer these. Let's talk about the scent first! I must be the only person that doesn't like the artificial minty scent. Everyone else, that has spoken about the balm stains loves the scent but its just not for me, however I'm not one to judge a product just on the scent. The colour I chose was 040 Rendezvous which is a very tropical orange shade. I love wearing a pink lip so for a change I chose this shade. The staying power is AMAZING ! Initially the balm gives you a very sheer wash of colour, however you can really build up the intensity taking this product from day to night. More so having worn the balm whilst eating and drinking your still left with a vibrant but non-offensive stain of colour on the lips - almost like you get after eating a popsicle. To really put this product to the test I wore the balm all day and even wore it to bed.I was really impressed that when I woke up the colour was still intact and as bright as when I first put it on. The balm doesn't leave your lips dry like most staining products do and does the opposite by really moisturising and hydrating the lips. I'm not too sure of the colour I chose, I think it makes me look a bit washed out and doesn't suit my skin tone as much as the usual colour's I wear so I think I'm going to be looking at the more brighter pinkier shades. Nice review,I'm planning to get them,should check the swatches and see what suits me better. I tried Revlon lip butters and they are ok.I like the fact that they are moisturizing. Wanna Try The New Lancome Mascara?